I admit I opted to be out of the craft world circulation and even getting in touch with friends and relatives. Months before and fter our trip in Dubai I started helping my DMIL and DFIL pack all their things as in ALL items in the house since they will be moving to a smaller apartment for elderly. DFIl has been really sick for a year ... in and out from the hospital for series of check-ups. Then less than a month that they have moved to the other apartment DFIL passed away. It was a big blow to all of us but I can personally say I was totally affected. The death was so painful but deep in my mind I know he is in a better place and he has finally met both my parents. For weeks I can smell him especially when I'm creating something or watching TV in the afternoon. There was no burial since he opted to be cremated ... we just had a very simple last respect gathering before he was cremated on that one fine sunny day last May. A week after he was cremated, DMIL asked me to buy Thank You cards so she can send it to all their friends who supported her during the family crisis. I, on the other hand still grieving refused to buy cards because I want to make the cards instead as my very last respect to my kind-hearted DFIL. 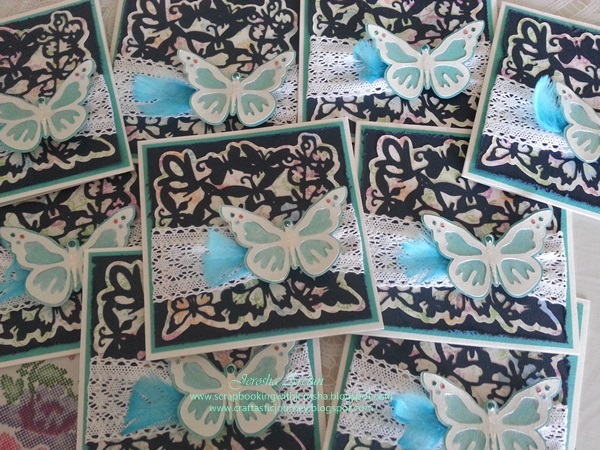 It was a complete shick for my DMIL when I delivered all the cards since she really had no idea that I will be able to make cards while I'm grieving ... crying almost everyday. Jerosha, I am so sorry that you lost your beloved father-in-law! I think you made his last part of life very happy! You are such a lovely and true person! God bless your family and you!